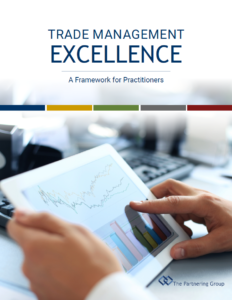 TRADE SPEND MANAGEMENT is one of the more intricate business activities for product marketers, as it intersects with the sales and account management process and has a highly significant impact on profitability. Many organizations could benefit from stepping up their strategies in this area, from the perspective of investment and customer planning; process and data management; compliance; analytics; and organization. At The Partnering Group, we work closely with Consumer Product Goods manufacturers to create high-level performance in Trade Management organizations across all these dimensions. Great plans require great implementation to deliver great outcomes, and in a business process area as complex as this, many individuals must work together to achieve success. This eBook is intended as a guide for professionals who sweat the details of Trade Management every day. It’s deliberately high-level, but it provides a framework for self-examination and improvement.